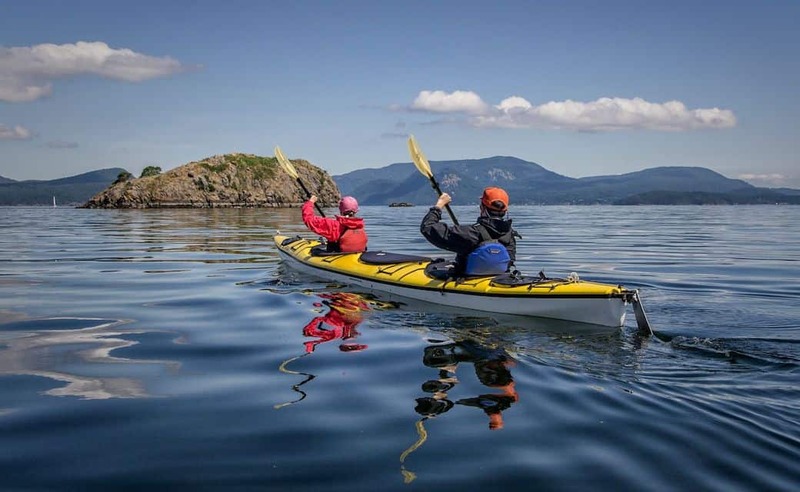 Roam the San Juan Islands at your own pace on this exceptional sea kayaking tour. Spend your days counting pinnipeds as you kayak through the home of the densest population of Harbor seals in the world. Look for black dorsal fins cutting the water indicating the approach of a pod of Washington State’s most iconic marine mammal, the Orca whale. At the end of the day pour yourself a drink and relax in the warmth of the evening light. It’s been another great day on the water and your body feels fantastic. Disappear into a maze of waterways and spend the week disconnected from the outside world. Or take advantage of modern living and tease your friends with selfies from remote shorelines with amazing views! This is your trip. We know that you want to spend less time traveling and more time sea kayaking. This trip accomplishes that goal and gets you out on the water faster than any other. No San Juan Island ferry hassles are necessary to begin your expedition. We depart directly from Anacortes, on lovely Fidalgo Island, and you can drive directly to us which saves all sorts of time, worries and added expense. The trip starts on Fidalgo Island and enters the waters of the San Juan Islands National Monument. 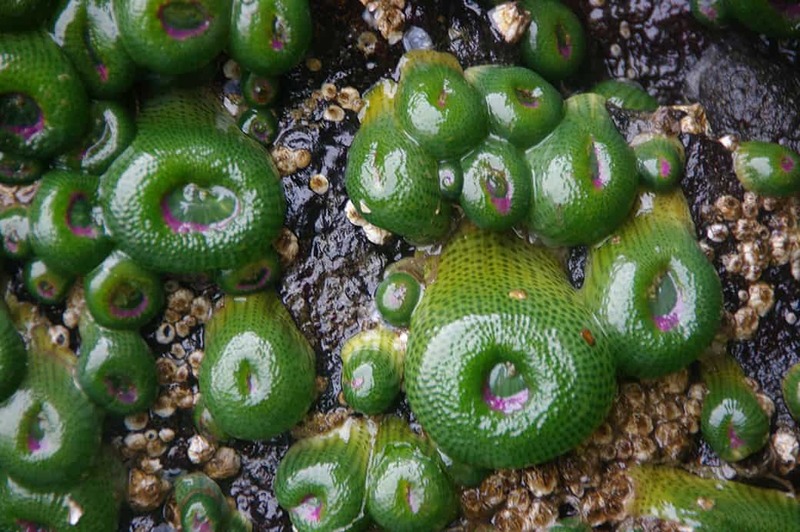 The protected status of the nearby Cypress Island Marine Reserve and it’s large neighbor to the west, Blakely Island, have created a healthy habitat that supports some of the most dense wildlife populations in the Puget Sound region. This abundance spills out into the surrounding waters and islands, creating many wildlife viewing opportunities. Bald eagles are common here and nest on nearly every island. Seals and porpoise are found in good numbers throughout the San Juans which has attracted the groups of Orca whales who hunt them. We have been seeing them more frequently in recent years than ever before, so keep your eyes open! The San Juan Islands are world famous for their pastoral beauty and protected waterways. Sea kayaking is the preferred mode of exploration, allowing you to slowly move through the landscape and see details missed by others. Gliding silently through a maze of islands you are treated to new vistas around every corner. Each island has its own character. Small historical family farms dominate the “Friendly Isle” of Lopez, while the outstanding Cypress Island Reserve is best known for its unbroken forests and dense wildlife populations. Orcas Island dominates the scene with 2400 foot high Mount Constitution, the highest point in the San Juans. The Wasp Islands Group, with its tiny cluster of grassy islands has long been a favorite place for visitors. We encourage you to collaborate with your guides on setting up the most rewarding itinerary for your group so that you can create the memorable and personalized experience that you deserve. Every expedition that we send out gets a lot of personal attention from us, and our 5-day trips are a favorite challenge. We understand that the one thing that you are sure to remember is whether you liked the food and so we focus intently on that. As the owners of the company we personally see to the creation of each meal plan on our multi-day camping expeditions. We source much of our food from local organic farms in the Skagit and Samish River valleys, and use the freshest seasonal ingredients possible in all of our dishes. On our 5-day trips we often make a quick stop at little stores found on certain islands to replenish our stocks and support the communities there. This allows us to offer the freshest meals throughout the excursion. If you have any special dietary needs then just let us know, we can accommodate almost any request. This is an authentic kayak expedition camping expedition! Once you depart from Fidalgo Island you will be entirely self-sufficient, carrying all that you need in your kayaks. Your campsites are all located on marine parks and offer splendid views right from your tent. Due to the dry climate of the San Juan Islands there is not enough water for showering, although many provide potable water. There is no electricity at these campgrounds and so we recommend bringing an external battery for your electronic needs. Washington State Parks operates well-maintained toilet facilities at each camp area. Like all of our kayak tours, this one requires no previous paddling experience. Because we depart from San Juan Island the first day can require longer paddling distances. If you wish for a less ambitious itinerary then please let us know at the time of booking so that we can discuss the different options available. The San Juan Islands of Washington State are the southern representatives of a massive island group that extends all the way from Washington State to Southeast Alaska. It is set apart from its northern neighbors in several ways that benefit residents and visitors alike. In the summer months the San Juans enchant visitors with a mild and warm climate with very little rainfall. In many places this produces a Mediterranean climate with associated oak forests and grasslands. Summer visitors can expect sunny days and comfortable temperatures. The calm summer weather patterns also means that we enjoy better kayaking conditions than other places in Washington State. Your five-day sea kayaking expedition will be the perfect opportunity to explore a wide variety of shorelines. 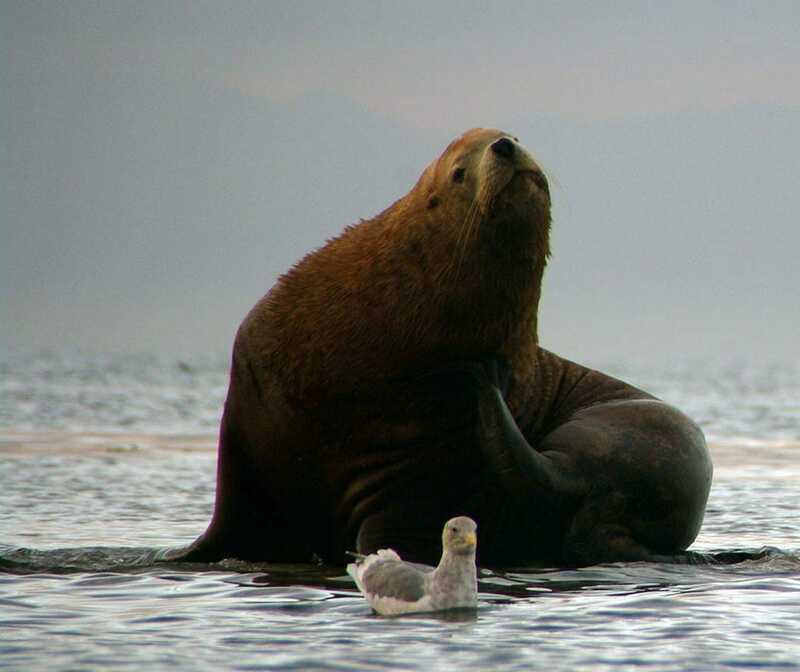 Beginning in the wildlife rich waters of Rosario Strait you will enter the heart of the San Juan Islands archipelago and visit islands that are only accessible by small boats. Washington State has preserved many places as Marine Parks, complete with camp areas and trail systems. The campsites offer peaceful views of the sea and are perfect locations to watch for passing wildlife. Orca whales can be seen hunting along these shores, and Rosario Strait has become the most common area for us to encounter them. Many a meal has been interrupted by the sudden appearance of these magnificent animals! Progressing further into the San Juan Islands brings a subtle change to the atmosphere of the trip. The air is often warmer and calm, and small farms come into view. Summer homes invite dreams of a quiet life away from the hustle of the city, and small watercraft carry island residents to their favorite fishing holes. Depending on your chosen route you may find yourself out in the Wasp Islands. Shaped by glaciers this cluster of small islets has been used for centuries by native groups as fishing and hunting grounds, and more recently has become a favorite stopping point for kayakers and boaters. As you begin to loop back toward Anacortes your group may choose to kayak along a slightly different route, bringing you to the Cypress Island Reserve. This is one of the most unique places in the San Juan islands, and a real treasure for Washington State. Cypress Island is the fourth largest of the San Juan Islands and 90% of it has been set aside for preservation. Free from the pressures of development the island has matured into a hotspot for wildlife. Miles of trails beckon adventurers, leading them into groves of old growth forest, hidden lakes, and some jaw-dropping viewpoints. Eagle Cliff is often the highlight for guests on our kayak trips that visit Cypress Island. Sunsets here are simply the best. Your 5-Day kayak expedition will depart from Anacortes in order to maximize your time and to avoid the San Juan Island ferry hassles. Because we make every effort to include you in how the trip will unfold the following itinerary is useful mainly as a hypothetical example. Some groups choose to cover a lot of territory while others are content with a more leisurely pace. Your guide will engage with you and the other participants to help you create the best possible experience. Arriving at our shop in Skyline Marina you will be welcomed by our friendly staff who will check you in, issue you dry bags, and give you directions to the launch site. Take your time packing your personal items at our office before making your way to the beach where your guide and logistical staff will already be packing your kayaks. After parking your vehicle and loading up the kayaks you will receive a pre-trip briefing with your guide. They will go over some safety considerations, explain the planned route for the day, and give you a short introduction on the basics of sea kayaking. After a last minute restroom break you’ll be off the beach and headed into the islands! We have three different Anacortes launch sites that we use depending on the prevailing conditions and the needs of the group. Your guide will determine the best route to take on the first morning depending on these factors. Launch from Cabana Beach at Skyline Marina. Passing between Burrows Island and the grassy slopes of Washington Park you will be treated to views of Rosario Strait and the islands that the trip will be passing through. After crossing the Strait your first landfall will likely be James Island, one of our favorite Marine Park camp areas. Some groups fall in love with the place and choose to stay, while more ambitious paddlers may choose to press on to Lopez Island. [Pro Tip: If given the chance, stay on James Island. It’s amazing!] After choosing your home for the night your guide will assist you in setting up your tents and the rest of the camp. The rest of the afternoon can be spent exploring the area, or simply relaxing on the beach. If there is time and you would like to participate in a short afternoon paddle then just let your guide know. Later in the day your guide will be busy preparing a delicious dinner for you to enjoy. If you are going to be out exploring the island then check in with them so that you can be sure to get the meal while it is hot and fresh. As the light changes in the evening you’ll want to seek out a special place to watch the sunset. Don’t forget to bring your beer or wine, it’s been a great day of kayaking and you deserve it! The second day of this trip is often where you and your guides will be deciding on how you wish the experience to unfold. For some people the goal is to cover as much territory as possible, putting in long days and lots of miles between camp areas. Other groups may prefer a more leisurely pace, often choosing spend multiple nights in the same places and making day trips with empty kayaks which require a little less effort to paddle. Maybe you want to split the difference, camping in new places each night but choosing islands that are relatively close to each other. Any choice is going to be rewarding, and your guide will help you decide on what will work well for everyone. Lunch is usually going to be prepared in the field during a stop along the way, and there are plenty of snacks available in between. After a preparing you a hearty breakfast your guide will talk with you again about the day’s paddling, so feel free to talk about what you are hoping to see and do. The exact time of your departure on this day is often determined by the timing of the tidal currents and how far the group wishes to travel this day. If you are an ambitious group that is putting in a lot of miles of kayaking then you might spend this evening out in the Wasp Islands, or perhaps you already pushed that far and are now looping around to a campsite closer to home. Either way you can be confident that you’ll find the day to be filled with satisfying views and fun conversation. The third day of this trip is when you will likely feel a transformation inside of your soul. The worries and stress of home give way to a sense of peacefulness. Everything is in place and you are carrying all that you need. It is this transformation that makes the longer kayak trips so special. Another delicious breakfast will refuel your body and satisfy your soul. On the fourth day you may find that repacking the boats has become a much simpler task than it felt on the first morning. Your transformation is complete, this is what you hoped for. Picking where you are going to spend your last night in the San Juan Islands is always a bittersweet choice. It will be good to get back, but you are not quite ready to leave. Early in the afternoon you approach your final campsite, in this story it is the Cypress Island Reserve. It’s been a fantastic day on the water and you are excited to explore another island. As your guide prepares the camp you are free to wander out on the trails on your own. If you are on Cypress Island then you won’t want to miss the exceptional views on Eagle Cliff. On a clear day you can across the San Juan Islands and into Canada. Behind you the massive Mount Baker rises high above the Cascade Mountain Range. 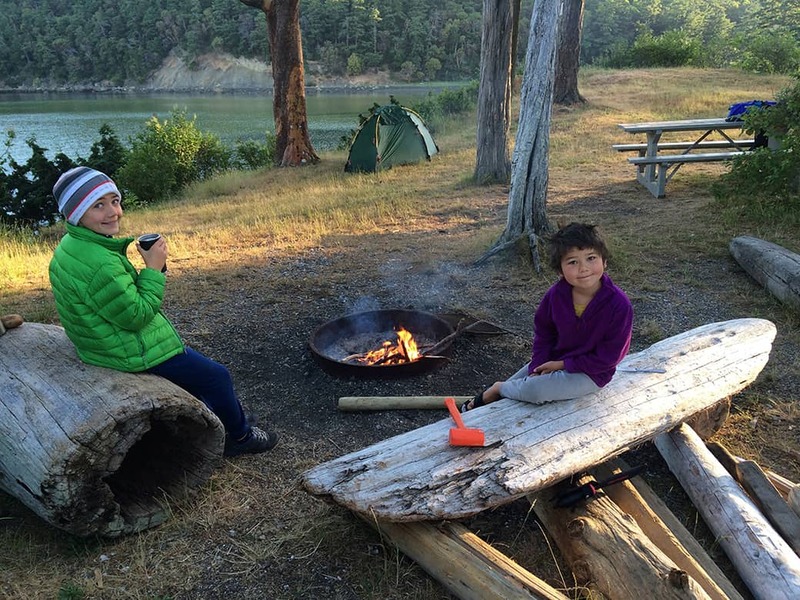 Back at camp you will want to open that last bottle of wine and make a toast to your next kayak trip in the San Juan Islands! 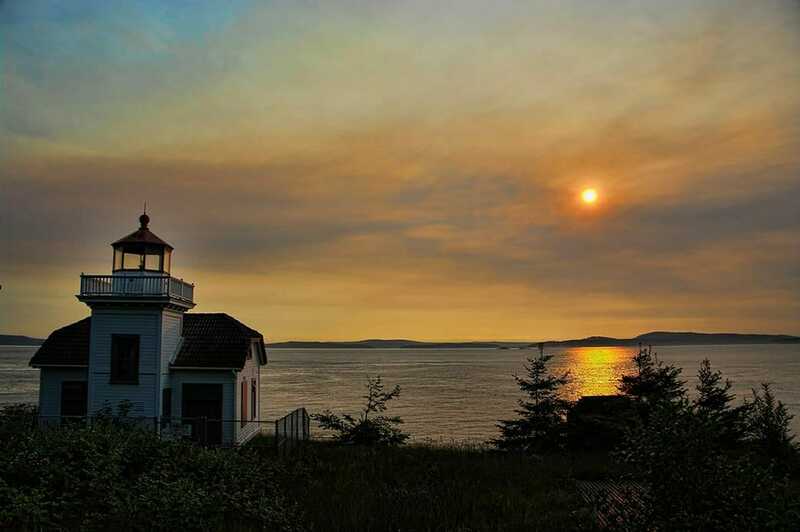 Greet your final morning in the San Juan Islands with a hot cup of coffee. [Pro Tip: If camping at Pelican Beach on Cypress Island, it is recommended that you wake early to see the sunrise over Mount Baker.] After breakfast you and your guide will talk about the last channel crossings and the best time to depart before taking down your camp and packing the boats for the last time. Lunch will usually be another beach break somewhere along the route home. Depending on the route you take, and the conditions of the day, you will likely return back to Anacortes sometime between 2:00pm and 4:00pm. The exact return time is difficult to predict because so many factors are involved with this sort of travel experience. We recommend that you do not schedule things too tightly just in case the weather or some other variable slows you down along the way. One of our logistics people will be there to greet you and help you unpack the kayaks. If you left any luggage at our office during the trip then they will bring that with them as well. After saying farewell to your guide, you are off to the next adventure. Hopefully we will see you again! This is probably the most popular question that we hear on the phone. We see whales on all of our different trips, but the frequency and proximity of sightings is impossible to predict. In the summers of 2016 and 2017, our Anacortes departures saw whales more than any other trip in the San Juan Islands. 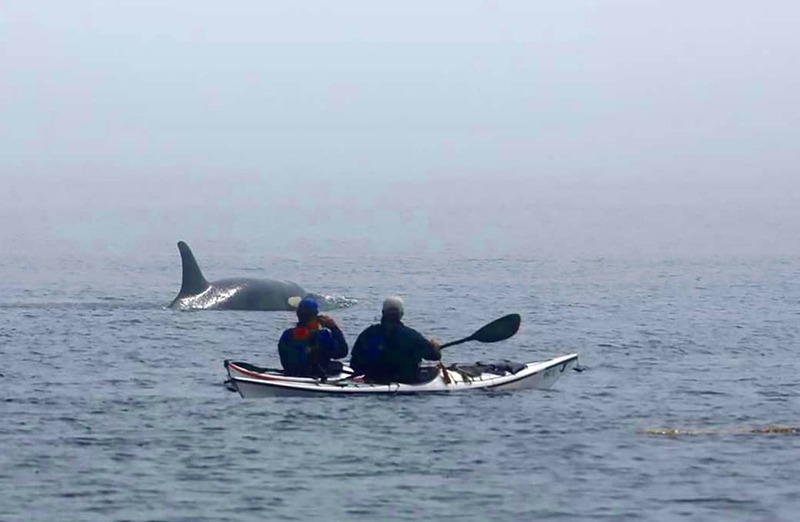 For more information about this subject please visit our Kayaking with Orca whales page. Yes! We have a limited number of single kayaks available to reserve. Check out our info on single kayaks for Multi-Day trips. We are currently the only outfitter in the San Juan Islands to be able to offer this option. The superior training and skill levels of our guides allow us to make this type of experience available to our guests. For our 5-Day kayak trips please meet at our store 2009 Skyline Way at 8:00 a.m, unless instructed otherwise by our office staff. We are located just past the Anacortes Ferry Terminal, in Skyline Marina. We like to try and get you on the water as early as possible to maximize your day.